In my experience, the best approach to any reception is to ensure the guests are fully engaged throughout the entire evening. To accomplish this, when planning any reception, I like to focus on something entertaining to happen every 30 minutes. This will ensure the guests have a little time to eat and mingle, but are being engaged. I like to mix the evening up a bit such as, have the Father of the Bride open the reception by introducing his daughter and new son-in-law and have them start their first dance. In between courses, have the guests get up and dance a few songs, bring in a special performer or have the Maid of Honor and Best Man give a toast. The last thing any Bride wants is for her guests to walk away from the reception remembering how boring it was or worst, for the guests to leave early. Over the next few days, I will share with you some options for keeping your reception engaging, memorable and moving. One of my favorite venues in Houston is the Houston Aquarium. This is a venue that is alive with sensory experiences as it is a joyous place for kids and adults alike. 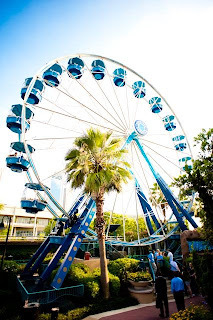 From the colorful fish to carnival rides and amazing views of downtown Houston. 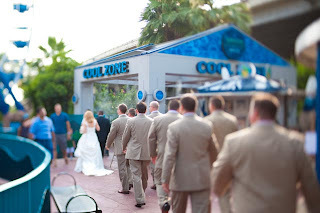 One of the most fun and unique ideas about hosting a wedding reception at the Aquarium for a couple’s guests would be the carnival rides they could take part in. As a favor to the guest, the Bride and Groom could place ride tickets inside of each of the guest’s seating card. This would allow them something fun and spontaneous to do during the cocktail hour and possibly when dancing started. At this particular venue, the ballroom has floor to ceiling windows and a wrap-around balcony which overlooks the carnival rides. To enhance the guests’ experience, it would be ideal to have the photographer bring a third shooter to take pictures of the guests as they are enjoying the rides. Once the guests are back upstairs in the ballroom, the photographer can upload the pictures to a slide show for guests to view throughout the evening. During dinner, the Bride and Groom may want to find a way to entertain their “younger” guests by hiring a clown to make balloon animals. This could be a station set up in the corner of the room or even in the foyer (this can be useful as children have a tendency to get restless during meals). As a last detail, the couple may serve fresh cotton candy as a mid-reception sweet or have decorative bags available for guests to take home with them. The amount of details that can be Incorporated is endless based on the couple’s taste.